I was told that Drew was a studio project with some folks who have done time in Bear and The Butterfly, among others. The sound is very easy listening indie rock laced with lots of reverb and delay. 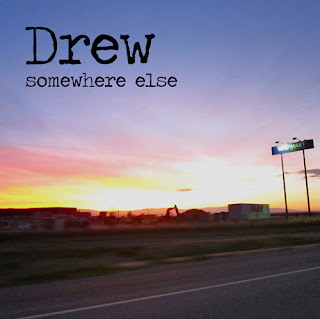 For the most part Drew is giving you some very subdued music with splashes of vocals that are very sparse. The slow fade in to "Port Angeles" sounds a bit awkward until everything takes shape and you get an idea of how the rhythm carries. I can't tell if the vocals have been double tracked or are just working with the help of some reverb. The song is quietly upbeat and until about 1:40 when it takes a slow turn with some pronounced bass drum and swirling guitar. "Quinalta" almost has a From Monument to Masses feel to it with the exception of the reverb soaked guitar. I kind of wished the drums would come in full force and carry the song. But, alas, the song runs it's 1:58 seconds without taking us there. In "Hoodsport" the band takes a bit of 80's new wave sound, not unlike The Smith or The Church. There's some acoustic guitar in the mix and the vocals are a consistent presence in the song. "Amanda Park" takes us back to the instrumental format, but keeps things upbeat. The drums do sound very buried in the mix and this makes the track consistent with the other songs. The 5:47 "Mount Baker" shows the band using a more conventional song structure and employing some piano to emphasize the epic feel as the song moves on and grows to a loud conclusion. "Tenino" creates a nice instrumental soundscape. The acoustic guitar works the backbone as we get a more defined lead guitar that takes center stage. "Olympia" takes us back to the upbeat 80's sound that I mentioned before and I think was probably my favorite track of the record. The vocals almost have that grit to them that creates a bit more of an urgent mood. At 1:22 the song takes an instrumental bridge and I couldn't help but be reminded of "Daydream Nation" -era Sonic Youth here. Around 2:13 the track really opens up and brings back the vocals. The record concludes with "North Bend" a 2 minute track of introspective guitar that, although minimalist in it's approach, acts as a sort "cooling down" or send off. Tracks like "Hoodsport" and "Olympia" were my favorite. This band can do the upbeat 80's new wave style very well and, if only the drums could come up higher in the mix, this band could be making music that would really nail that sound well.